Last year, we were looking for a 6 day/ 5 nights getaway with our twins, and we wanted something more tropical the beaches in sunny So Cal could offer. 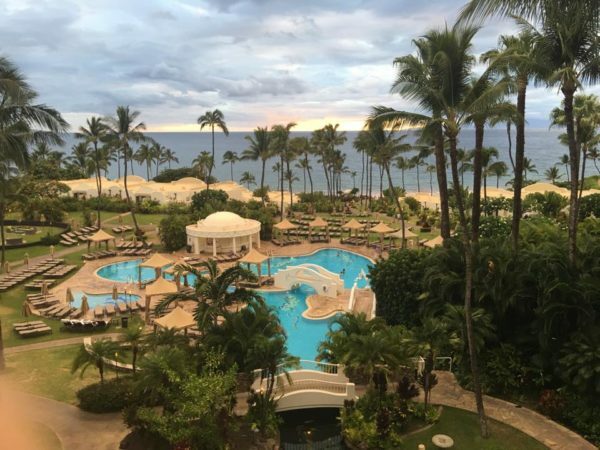 After months of researching and scouring through websites for packaged travel, I came across a great deal on American Airlines for flight and room stay at the Fairmont Kea Lani in Maui, Hawaii. We had 7 days to get there and back with our 5-year-old twins while our older two were on an Alaskan cruise with their grandmothers. Our twins had never been on an airplane before, and my husband and I desperately needed some down time before the start of another crazy school year. We couldn’t pass up the opportunity to get back to the islands after 13 years, and indulge our little boys on a special trip to a place that was truly magical for us as a couple before the realities of life settled in on us. 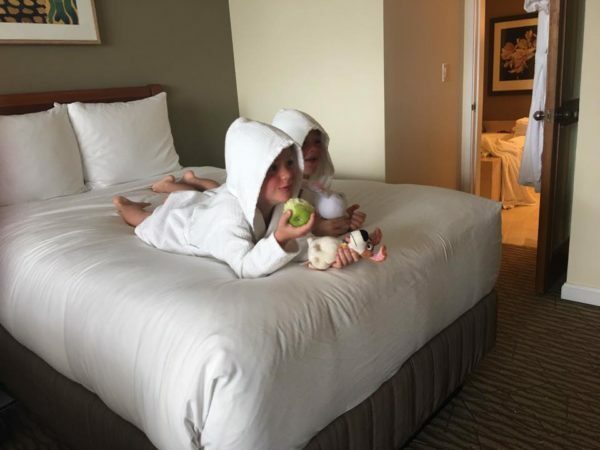 From the minute we arrived to the second we left, our family felt relaxed and pampered the entire stay at the Fairmont Kea Lani. Everything we needed was right there on resort property. The Fairmont hotel group has not yet disappointed us in the family travel department. Like most of the Fairmont Hotel Group properties, the Fairmont Kea Lani is an all-suite resort. In fact, it is the only all-suite resort in Maui. This is key when traveling with families- large or small. Though we didn’t have all 4 of our children with us, we still enjoyed the additional space the Ocean View Suite provided us. The suites are appointed with kitchenette-type amenities with a mini fridge and coffee maker, making it convenient for snacks, drinks, leftovers to be stored while mom and dad could enjoy a quick cup of coffee in the morning, or a lazy one, out on the lanai. The Fairmont Kea Lani also offers Villas for larger parties or events. We also loved how it perfectly matched our needs as a family to indulge in different activities. 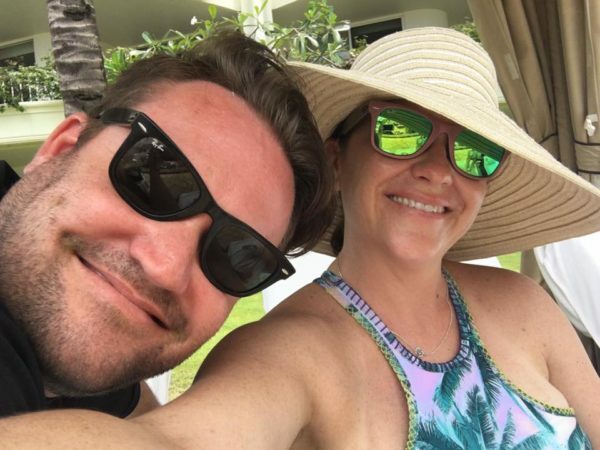 It was important to my husband and I to have some much needed down time for ourselves, while also engaging our boys in the many activities we knew they would want to participate in. We spent most of the days either at the pool or the Polo beach (located directly in front of the hotel property). While we were there, the Willow Stream Spa (ah-mazing!) and the Keiki Lani Kid’s Camp was running a special where the kid’s camp was complimentary to guests who booked a spa treatment between 9am and noon. Oh, yes, we totally took advantage of that program. 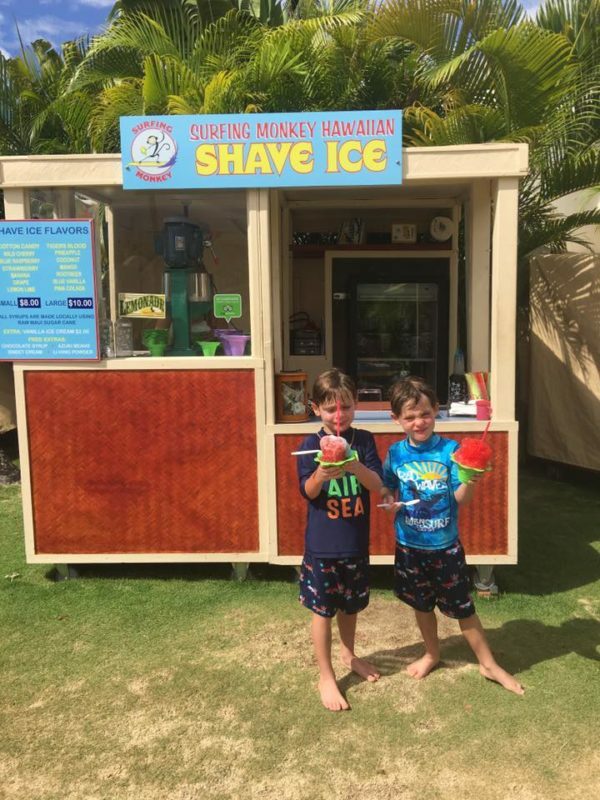 Another fabulous advantage for families with children 5 and under at the Fairmont Kea Lani…kids eat free. Say what?? Yes, it is true. 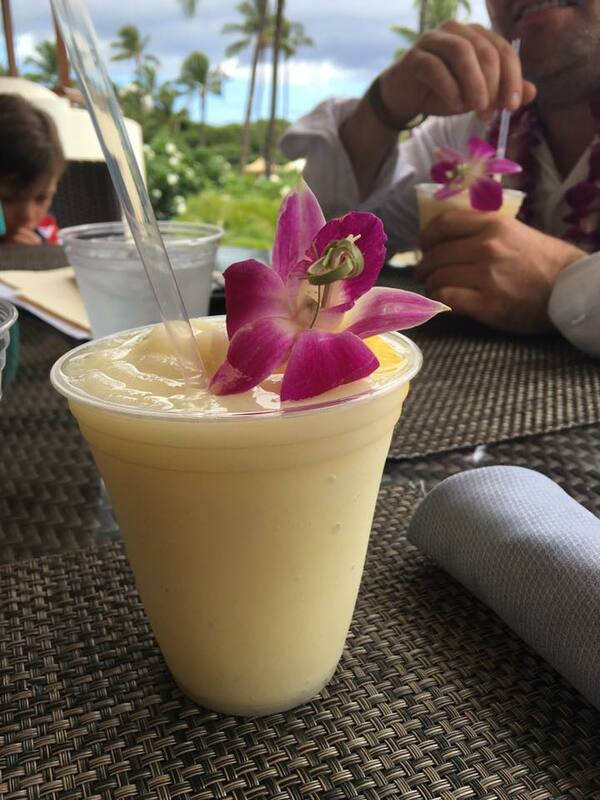 At the daily breakfast buffet at the Kea Lani Restaurant and the poolside Ama Bar and Grill (in-dining only), our twins ate free. Not sure why we had such a hard time wrapping our heads around this, but it was like going to Disneyland while your kids are still 3 and under, but better because we were in Hawaii. Children 6-11 eat for 50% off the regular menu, or can still choose from a kid’s menu, offered at every restaurant, including Nick’s Fish Market and Ko. Every time I contemplate this question for a hotel review of a Fairmont property, I really have to search to find something. The one thing that comes to mind is the logistics of the pool. There is an adult pool and the two activity pools. The two activity pools are connected by a water slide, so there is a pool up top with a swim-up bar, and a pool down below with fun stuff like a basketball hoop and the activities desk. Both pools are lined with cabanas and also lounge chairs. Since we did not have our older two with us, who we normally would have put in charge of keeping an eye on the twins, we had to make a tough choice as to which pool we should camp out at. We tried both the bottom and top pool, but ultimately decided on the top pool as it was a bit smaller and of course, the new swim-up bar. Once acclimated, we felt OK with the boys going from top to bottom pools via the slide, but there were many times where they wanted to stay in the bottom pool to play with new found friends. You physically cannot see the bottom pool from the top pool, so this created a bit of stress for us as we had to keep moving up and down the stairs to check on them. Also, the pools are a bit small for the size of the resort. We happened to be there towards the end of their summer season, but I couldn’t imagine being in the pool area during high season, especially with the way the pools are set up. There is no way I would have been able to relax without our older kids to help out. Most likely, we would have opted out of the pool scene and stuck with the beach if the crowds were any bigger. Getting There The one thing I forgot about with Maui is the distance from the Kahului Airport in Kahului to Wailea. Plan on at least one hour in a personal vehicle, meaning like a ride share, taxi or rental car. Uber and Lyft are both available. We chose Uber SUV as we had the boys with us and they were still in booster seats at the time. It was a comfortable ride, even though we were all exhausted from the flight. Something to consider with transportation…if you intend to explore the island at all, think about a rental car. Wailea is one of the more popular resort towns, but everything is at least 30-45 minutes if not longer to get to, and taxis can get pricey. It would be worth the investment in a rental car if Kihei, Lanai, the Road to Hana is on your itinerary. If you plan on getting to your resort and staying put, then I would rather put my dollars on a beachside cabana vs. paying parking fees. Of course, the Fairmont Kea Lani also offers Private Transfer Services with varying options and prices. Built in the late 1990’s, the Fairmont Kea Lani still remains a top luxury resort in Wailea, Maui. The grounds are lush and also manageable, which is great when you have little ones. There is no boat to catch to get to the other side of the resort. The pools are tidy and layout is easy. One of my favorite things about resorts in Hawaii are how grand the lobbies are and the use of optical pleasure taking into account the easiness of architecture because the landscape of the island provides a perfect backdrop. The Fairmont Kea Lani’s lobby does not disappoint with a Morrocan style grand entrance, yet also nodding to the Hawaiian culture. The boys loved when the sun was about to set, how the Fire Starter would blow the conch shell then light his baton on fire while he ran through the hotel grounds personally lighting every torch with his own. My twins would chase after him, laughing and screeching the entire time. As much as I loved the hotel, I couldn’t help but notice time had left its mark in some areas. With that being said, during our stay there were a few small construction projects happening throughout the hotel, and the room we stayed in had been recently renovated. Clearly, there are some efforts being made to keep the hotel in tip-top shape. The Rooms As I mentioned earlier, the Fairmont Kea Lani is the only all-suite resort in Maui. We started in a suite with two doubles overlooking the pool area, which was miserable for my husband who is the lightest sleeper (and the loudest snorer) on the planet. So we asked to be moved to an ocean view suite. I mean, who wouldn’t want to view the ocean anyway when you are in Hawaii? For the record, we did have somewhat of an ocean view; it is difficult to miss the ocean when the resort side faces that way. The new suite, however, had the most gorgeous view of the ocean, and also of the rooftops of the Villas below us and the residential neighborhood next to us. Not a huge deal to me, but just mentioning it for those who only want to look at the ocean and nothing else. The suites are spacious. Our new suite had a king size bed in the bedroom and a pull-out sofa in the sitting/living area. This worked well for us as we put the boys on the pull-out sofa bed. The bathroom was also generous in size and amenities with a separate tub and shower, and a whole lot of counter space. Obviously, this size room worked well for us with just a party of 4, however, with our other two, we would have needed to upgrade to a 2-bedroom suite. The Amenities There is a great spot called Cafe Ciao Bakery and Market inside the Fairmont Kea Lani. Yummy sandwiches and pizzas, barista-made coffee, lots of healthy, organic choices for snacks and drinks, and of course, Hawaiian souvenirs. My husband and I also enjoyed the swim shop there, Le Surf Wailea. We both bought new suits there and picked up a few specialty items for all four of kids. 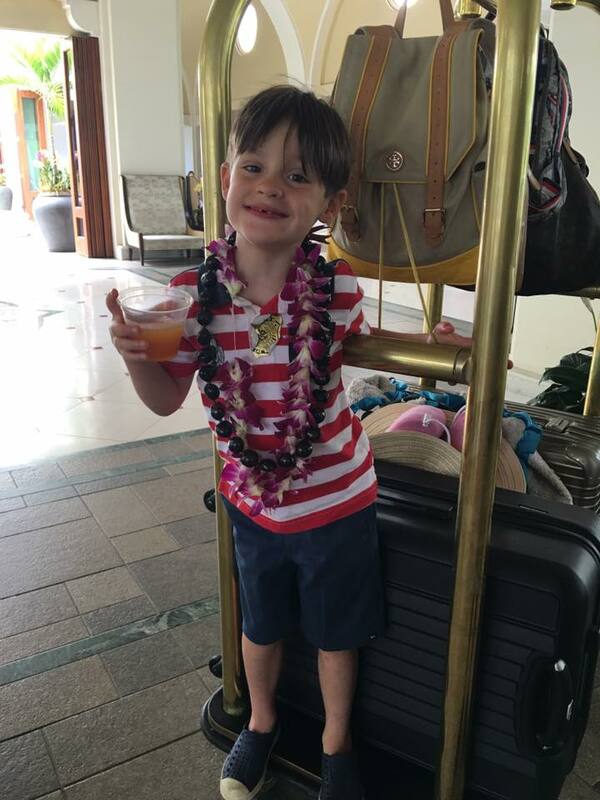 Our boys also loved the Fairmont Kid’s program where they were each given a wooden beaded necklace with a Hawaiian symbol, like a turtle and a hook, bath robes just their size for the rooms, a backpack with goodies and an on-property scavenger hunt. There is also an adequately sized game room featuring billiards and air hockey. Of course, there are the two family-focused pools, but there is also an adult only pool, for perhaps when you drop those kiddos off at the Keiki Lani Kids. There is also a nice Hawaiian Cultural Program offering opportunities for guests to immerse themselves in Hawaiian culture. 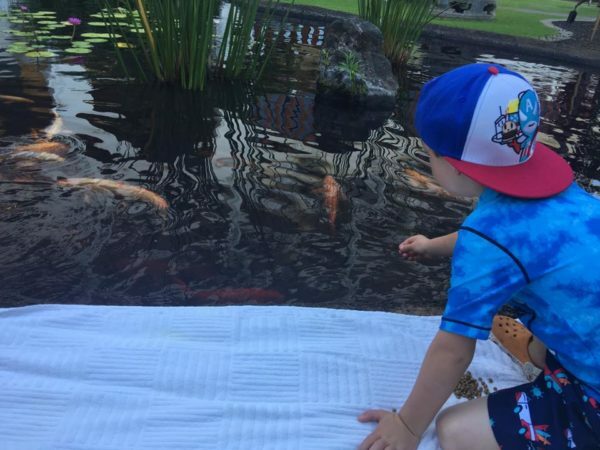 Beyond the Torch Lighting Ceremony, the boys enjoyed learning about and feeding the Koi fish in the resort pond. There are also activities like lei making, ukulele and hula lessons, canoe experiences, walking tours of the property and much more. And, let us not forget the spaaaaahhh….The Willow Stream Spa offers a decent menu of services. My husband and I opted for the couple’s massage, and they had a great deal going on in conjunction with the Keiki Lani Kids Club. The kids club does offer outings and half, full day and hourly options. There are arts and crafts and video games, board games and other activities. My two were a tad bored because they were the only kids in the club that day. All their new friends were hanging poolside…which they obviously preferred better. But mom and dad needed some relax time. Finally, the pool and beach make it super easy for families to enjoy themselves without having schlep tons of stuff. At the pool we rented a cabana, which came with a cooler of drinks, use of sunscreen, and a chilled fruit platter. Around the pool the kids could use pool toys, play basketball, volleyball, and every now and then a staff member would walk around with trinkets or game ideas. There is also thoughtful amenities like complimentary sun block and ice water. The Polo Beach is amazing as well. While technically not private, it was pretty darn close. It is one of the more secluded beaches in Wailea and the Fairmont Kea Lani has a little shack out there where they assist with beach chairs (first come first serve), towels, boogie boards, snorkeling gear and other beach necessities. Ah… Reminiscing through these photos is making crave some Hawaii time! Book now for Spring Break! Disclaimer: On occasion, RockStarMomLV.com is offered discounted or complimentary stays and/or experiences in exchange for honest reviews. Any and all reviews are the written opinion of Stefanie Van Aken, RockStarMomLV, and are solely based on her personal experiences and opinions.